A succession of locally-produced television shows about horse racing occurs every weekend morning on Channel 12. For the most part, they’re produced by Capital District OTB (Albany, NY). Horse ownership partnerships such as Karakorum Racing, West Point Thoroughbreds, Hibiscus Stables and Whitehall Stables vie for time with automobile hucksters par excellence Kara DePaula and Billy Fuccillo when the cameras aren’t trained on the on-air hosts, who sit at table in front of the Clare Court half-mile course as the horses gallop by in the background. 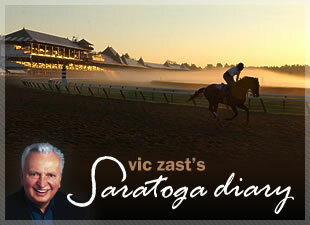 As for the production value, it isn’t the same quality as the NBC Sports Group’s “Summer at Saratoga” series. But it’s fine. The knowledgeable hosts tend to bob their heads in agreement like the reclining toy dogs you sometimes see above the back seats in low-riders. The camera is often focused on the wrong person when another person is talking. There are 60 seconds of tropical steel band music playing over a screen graphic when the show can’t find an advertiser to fill in the down time. Alas, it’s a charming turn-on that you won’t find in 99.99 percent of the country. Fortunately, the backstretch telecasts were all concluded when the first of two major rainstorms passed through the area. When a thunderstorm hits Saratoga, it hits like dynamite – this particular storm was 30 minutes of air assault warfare. The $150,000 gr. 2 Lake Placid Stakes was the only race left on the grass after the rains came and, man, they came. When 2-5 Winter Memories ran fourth, she caused show prices bigger than place prices. The contestants in Race 7 had to deal with the second outburst, this one bigger and shorter than the first. Beautiful But Blue, the 5-2 favorite in the seventh, was one of only three front-runners all day long to be caught from behind. The first six races except for the Lake Placid, as well as the eighth and tenth, were won by horses that ran and hid. Apart from the horse racing, kids ruled. 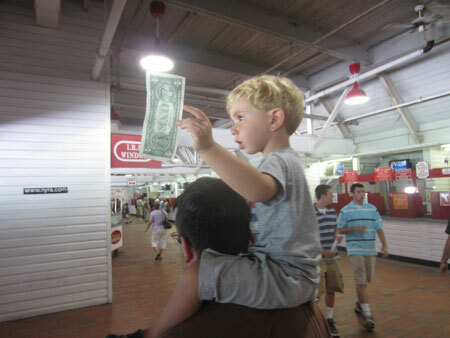 “Two Buck Chuck” Charlie Zast, age 3, cashed his one two-dollar wager on pace-setting Spare Change in the second. 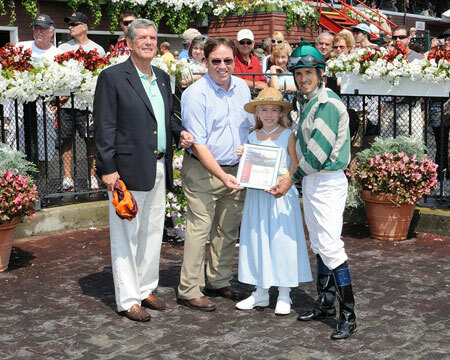 Alayna Gray, age 7, of Johnstown, NY had the first race named in her honor for winning a poster contest. Caption: Charlie Zast off to spend his winnings on a Sloppy Track shake at the Shake Shack. Caption: Champion poster contest artist Alayna Gray with the connections of winner of the race named in her honor. State-bred fillies and mares will run in the $75,000 Union Avenue Stakes on Monday afternoon. On Monday evening, the jockeys will compete in karaoke at the Vapor Club to raise dough for the Permanently Disabled Jockeys Fund. An American Idol talent scout said they’ve been rehearsing at John Velazquez’s house to prepare for their one shot at fame. If so, the show will be fun.